In its first two years of implementation, the Minnesota Border-to-Border program distributed $30 million to 31 rural Minnesota communities. But the state has not put enough money into the program and needs to put more focus on getting investment in Greater Minnesota cities to spur economic development. "Getting the Rules Right" is a policy brief on the Border-to-Border Broadband program. It covers what the program is, how it works, and why funding must be expanded in order to serve more greater Minnesota communities. Since 2014, Minnesota has been promoting the expansion of high-speed Internet access across the state through its Border-to-Border Broadband Development Grant program. The program is intended to help bring high-quality Internet access to unserved and underserved areas in Greater Minnesota; without public support, these communities would continue to be left behind. In its first two years, the state awarded about $30 million to 31 Border-to-Border projects. The program has been well administered but should be modified in two significant ways. The grant program needs to be funded properly. 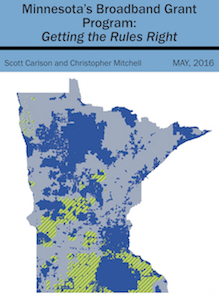 The Governor’s Task Force on Broadband estimates Minnesota’s unmet broadband need is $900 million to $3.2 billion. That level of investment is simply beyond the capacity of existing telecommunications providers to meet without public investment. There is a dire need to dramatically increase funding for the program. Even with adequate funding, the program’s rules and criteria need to be reconsidered to meet its economic development goals. Under current rules, the Border-to-Border grants could inadvertently harm the very cities that conceived the program. The Broadband Development Grant program is at a crossroads as the Minnesota Legislature, in the waning days of its 2016 session, considers whether to substantially ramp up funding and possibly revise the funding criteria. The Legislature should set a robust goal, increase funding to the grants program, and ensure some of the funds are used to target economic development in Greater Minnesota population centers. In 2014, RS Fiber in South Central Minnesota was awarded $1,000,000 through the Border-to-Border fund. RS Fiber: Fertile Fields for New Rural Internet Cooperative shows how the grant was used to help build a brand new cooperative model for rural Internet service not seen anywhere else in the nation. Our economic development page shows how community broadband networks create jobs by ensuring businesses have fast, affordable, and reliable Internet access.